In his debut article for The Football Front, Lizo Johnson explains why Everton could finish higher than Liverpool for the second season in a row. As I write this Everton sit 3rd in the premier league, and their great Merseyside rivals Liverpool currently lie in 18th. Historically Liverpool has always been the number one club on Merseyside. The most successful club in English history. Everton have always lived in the shadow of their close neighbours and rivals. They have always seen as the underdogs in the derbies and never really given a chance. But this year it could be different. I’ve seen Everton’s last two games and both times I have been thoroughly impressed. Players playing under David Moyes have always had high work rates and high levels of self belief, but Everton’s team this year has something else. During his 10 year tenor as Everton boss his team have been famed for their 1-0 wins, built on strong defences. Set pieces whipped in towards the aerial assassin Tim Cahill were the order of the day. That’s not to say Everton don’t still have that strong defence, with Hibbert Jagielka Distin and Baines remaining constant for several years now, but these days Everton step out onto the field every week without any thought of a draw in mind. We saw the beginnings of it last season with the excellent signing of Nikica Jelavic. At £5.5m he has turned out to be an absolute steal, smashing in 9 goals in 10 games towards the back end of last season. They drew 4-4 at Old Trafford, a truly spectacular and deserved score line. In previous years Everton had gone to teams above them in the league in the hope of a draw, sitting back and relying on counter attacks and set pieces. Not in 2012, they went for it and played some fabulous football, and came back from 4-2 down with 7 minutes to go to claim a point. Just last week we saw evidence of Everton’s new found attacking prowess. In their last 2 games Everton have smashed in 5 goals from a variety of sources. Against Newcastle the combination play was exceptional, especially down the left between Pienaar and Baines, two players that know each other’s games inside out. They cut through Newcastle at will and were extremely unlucky to only collect a point having dominated the game and had two goals unfairly ruled out. The early kickoff against Swansea was seen to be a real test for Everton. Last season very few teams went to the Liberty and took the points. Everton pressed high got the early goal and took it from there. Swansea’s usually dominant passing was nowhere to be seen with Everton even taking the lion’s share of the possession statistics with 56%. When Mikel Arteta left Everton it was a devastating blow. Many thought that Everton’s midfield would struggle to recover. But like many teams once the main man had left Everton just grew tighter as a group, and their midfield were imperious on Saturday. One thing Arteta definitely never had in front of him was a clinical finisher. This season Everton have that player. 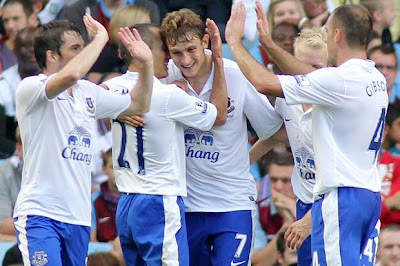 The aforementioned Nikica Jelavic is there to tuck away the chances created by the likes of Pienaar and Baines. Now, Leighton Baines. As much as he’s highly rated across the country, I still feel that people do not fully understand the ability of the man. For me, he is among the best left backs in the world. The only reason he is not internationally respected is that he is not at a club that gets enough coverage across the world. That is not to say I think he needs to move, because he is so settled at Everton, but he could walk into any team in the premier league bar Chelsea. Its’ up to him. To illustrate prove my point, so far this season he has been the most creative player in the premier league, creating 24 chances this season and averaging a chance created every 18.75 minutes. He has created more chances for his side from left back than players like Santi Cazorla (20) and David Silva (14) have from much further up the field. This is why I feel that his importance to Everton cannot be overstated. To give a recent example of the attacking capabilities of Pienaar and Baines, against Newcastle they had the highest number of penalty area entries of anyone in both sides (5 and 6 respectively). 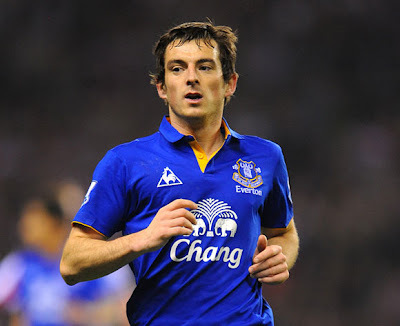 The two even combined for the first goal, with Pienaar playing through Baines who fired home. In the second half Everton had two goals wrongly disallowed, with one player I have yet to mention instrumental in them both. Marouane Fellaini. When Everton paid £16m him, many a head was turned. Not only because he was a young, unproven player, but also because up until that point Everton had always been very shrewd with their transfer business. They only paid what they believed players to be were worth. And there were very few people at the time who believed he would be worth £16m. Four years later, and what then seemed a strange signing has proved a master stroke. The big Belgian has impressed everyone since the moment he stepped into Goodison. He arrived. It’s another classic David Moyes player really. Hard working and fully committed on the pitch, but off the pitch you never hear a sniff of late nights on the town or training ground bust ups. No. He keeps his head down and keeps working. Or at least he did until last week. Fellaini apparently told a Belgian newspaper that he was ready to leave Everton at the next opportunity. This broke the code. David Moyes and Fellaini himself have been quick to quash the exit rumours, but we will see how it develops. One thing’s for sure though, if he continues this season in the same vein that he’s started it in, this will be his best season yet. Fellaini embodies David Moyes’ Everton machine. Hard working, relatively unknown player signed for what proved to be brilliant business. That is a sentence that could be attributed to the vast majority of Everton’s signings in the last 6 years. So I was surprised when I heard that Everton had signed Kevin Mirallas, a player who has earned the nickname ‘the Belgian Ronaldo’. It didn’t fit, he appeared to be a flashy goal-scoring player who, with the nickname he has, I presumed would rarely return from the oppositions half. I presumed wrong. Whilst his goal-record is undoubtedly impressive, another thing I’ve noticed about Mirallas is that he doesn’t forget his defensive duties. It’s true that very occasionally you see him attempting a few moves for the next YouTube compilation but that won’t concern David Moyes. What is most important for Everton is that he seems right at home in his new surroundings. Three games, three excellent performances and the future look bright for him at Everton. Everton’s next three premier league games are at home to Southampton and away to Wigan and QPR, and on current form you cannot see them dropping many points in those. And after that it’s the big one, Liverpool. Everton are no longer a side to be overlooked. They can and it looks like they probably will beat their neighbours in that fixture. And I think they will beat them again in the overall table come next May. Yet despite all this, I still see two major hurdles for Everton. Firstly, injuries. They have an outstanding first eleven but when you look past that it gets less impressive. If Everton’s main men get injured it could spell disaster. The likes of Baines Fellaini and Jelavic simply must stay fit if Everton are to have a successful season. The only other hurdle I can see for Everton is consistency, something they’ve always had a problem with. But get some momentum going, and ride some luck with injuries, then Everton can be as good as they want to be. It’s a long season and a good start means nothing if you cannot sustain it (I’m sure Wolves fans will testify to this), but we will see.